Spend the day in the Columbia River Gorge and you will see first-hand the breathtaking beauty that visitors have raved about for years. Simply follow Highway 14 before crossing into Oregon at the Bridge of the Gods and return to Vancouver via the Interstate 205 Bridge. You'll be hard-pressed to find a more scenic loop in the country. Visit the internationally-known woolen leader and take a tour of the Pendleton Woolen Mills to get a taste of how the products are made and why they are beloved by so many. Plus, you can pick up clothes, material, or the perfect wool blanket for that picturesque picnic later in the day! One of the tallest monoliths in the country, this 898-foot tall viewing point atop the core of a volcano is located just 20 minutes east of Washougal on Highway 14 and truly captures the beauty of the Gorge. You can choose to enjoy the 9,500 feet of freshwater shoreline, hike the switchback trail with unparalleled Gorge views. Located in North Bonneville, this massive dam that arose as part of Franklin Roosevelt&apos;s New Deal in the 1930s has been captivating visitors ever since. With historical exhibits, a visitor center and a fish ladder viewing station, it is going to take some effort to pry yourself away for the rest of your Gorge journey. While you&apos;re there, make sure you pay a visit to Herman the Sturgeon. This 11-foot-long, 500-pound, 70-year-old white sturgeon is a sight to behold! Immerse yourself in the history at the Columbia Gorge Interpretive Center Museum, take a hike or bike ride through the picturesque terrain, or grab a frosty pint at Walking Man Brewery in Stevenson. This small town nestled along the Columbia River Gorge offers an array of outdoor activities, historical attractions, and great food and drink. Hop aboard this old-fashioned triple-deck sternwheeler boat to experience the Gorge way Lewis & Clark did—from the water! With meal cruises and sightseeing excursions offered, this is your chance to see the Gorge from the water. Looking for a perfect photo location to document your unforgettable day trip? 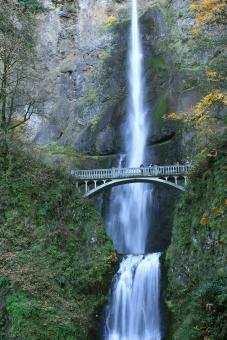 Multnomah Falls, on the National Register of Historic Places, is your spot. You can choose to gape up at the 611-foot-tall waterfall from down below or, if you&apos;re feeling adventurous, make the 2.6-mile round trip hike to the top. Built to "Afford shelter and comfort to all who come to look at the splendor of the scene" in 1917, the Vista House is one of the most iconic structures in the Gorge. This historically significant structure offers educational and interpretive exhibits, guided tours, and a gift shop-and the view is remarkable!